And so it has happened. The four-time World Cup winners have failed to even qualify for the event that comes next year. Gian Piero Ventura failed to lead his side to the World Cup – which will be the nation’s first miss since 1958. The fans want his head on a pike – in a figure of speech sort of way (or maybe really, who knows?) – and are looking at an abyss from which there seems to be no return. It is only natural – after all, a World Cup without Italy is a very weird one as they are the second most successful team in the tournament, joined with Germany with four World Cups titles. 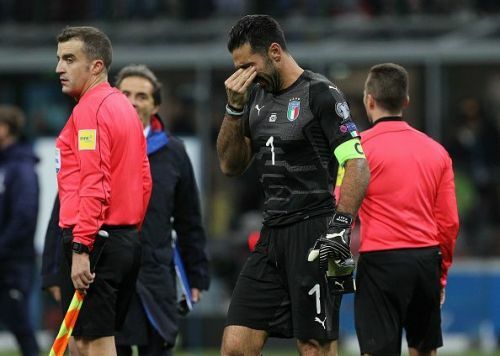 But that is history; the reality of the present is that the Azzurri are not going to the World Cup in Russia next year. Things will have to take a new direction for the supposed giants of Europe as the only way from here is up. There is a reason why Italy have won the World Cup four times in their history – they are no muck in the greatest tournament the game of football has to offer. Indeed, along with Brazil and Germany, one could never count out the Italians – no matter how weak the team is. For instance, Antonio Conte’s Italy were far weaker than what Ventura had in his hand. Indeed, that team had the likes of Marco Parolo, Emanuele Giaccherini and Alessandro Florenzi in midfield along with mediocre players like Eder and Graziano Pelle in attack. And yet, they only just failed to reach the semis of the Euro 2016, losing to Germany on penalties in the quarter-final. However, with their exclusion, the World Cup has one less competitor who could actually provide a fight against the giants of the game.